This is a couple of days after the fact, but I just thought I’d mention that the concert that Janet and I went to on Saturday evening has hooked me on the concept of “house concerts”. In terms of concert intimacy, they are the ultimate. 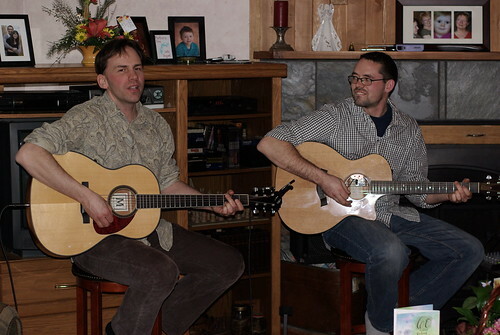 I won’t go into details about the house concert by Dale Nikkel and Kimbal Siebert because Marc, Sharon, and Linea (the birthday girl) have already blogged about it. Check out the links for their impressions. This entry was posted on Monday, March 16th, 2009 at 7:31 pm	and is filed under Friends, Music and Movies. You can follow any responses to this entry through the RSS 2.0 feed. Both comments and pings are currently closed.